Errol: Sorry guys, my week has been crazy busy! Monday, my cousin (Memes), Debs and I take a Salsa class. Debs reminds me there is this seminar for posture to help you sing and I was going to go. It was happening Tuesday. Oh crums. I was going to go to a movie with Manda and Memes on Tuesday. We were going to see that Tattoo movie (no, not a Fantasy Island Remake). Not wanting to bail out on a free workshop, I reschedule my movie going ways to Thursdays. (Not Wednesday because I have band practice). I then talk to Daeja the next day, who asks if I’m still interested in going to the William Gibson talk that she had an extra ticket for. Of course I am! And of course, that was happening on Thursday. I still went to the movie. I got home at 2am. Good grief. So this is the reason the comic has been late every day. I hope to go back to our regular scheduled programming by next week. 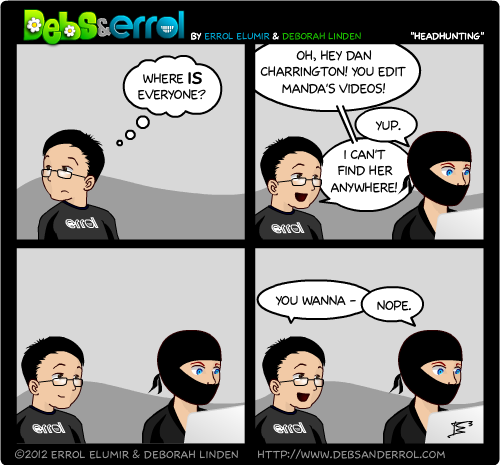 Oh, btw, that’s Dan Charrington in the comic and his website is TheVideoNinja.com. It’s not that I was so lazy for comic character creation that I just put him in a mask. Although… that IS a good idea. Hehehehehehe, it’s funny ’cause it’s what he’d say. Oddly enough, I do most of my editing in a ninja mask. That’s why nobody knows who I am! I find it scary how well you nailed my “character” too. Are you stalking me? I am not listening to your G-Con video at this moment either. And you won’t show me??? I like how we’ve just resolved to call me “Error” now. Seeing how it was created in 10 minutes with a pencil and lined paper, I’m not sure how it would match up to the quality of your beautiful and fabulous comics. Can’t you just take a picture and tweet it so we can see or something? Not at all. I still don’t understand twitter. 🙂 FB then? Meh, I’ll put it up on TinyPic later. You’re not getting my Facebook. Sorry, pal. I don’t stalk that much!